What Makes for an “AWESOME” Description? 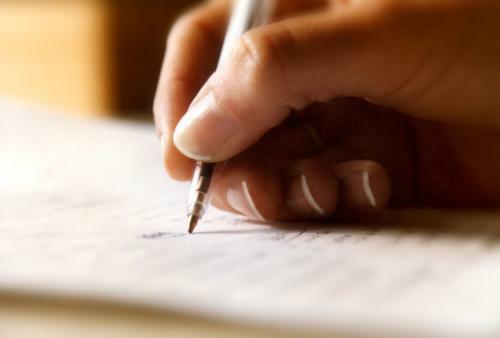 1) What are “good” adjectives and adverbs? 2) And are “good” adjectives and adverbs necessary and sufficient conditions for good descriptions? Truth be told: I don’t know. That’s why I’m writing this blog article. I thought that maybe you’d like to join me for 2.5 pages of discovery: What makes for an AWESOME description? When I was 3-years-old, I liked to play dress-up. My diminutive mother had a basketful of dresses that she’d retired, and I made ample use of them. I’d layer dress over dress and top things off with a few colorful shawls and scarves. My philosophy was – and I vividly remember thinking it – the more the better, the prettier, the lovelier, the more enchanting. Snow White, step aside! I actually looked more like a bag woman, and I’m sure that my parents had a good laugh while snapping pictures of me. But in those days, I thought I looked like a “delicately enchanting” princess with not-so-flaxen curls. This brings me – some 42 years later – to the conclusion: Less is more (more or less). Sure, satire, comedy and farce can tolerate gratuitous adjectives and adverbs; but most prose should not be weighed down, bag-woman style. That means YOU might love words like “essentially” and “ameliorative,” and your elementary school teachers would have applauded your “utilization” of them. But I’m here to say (to myself, mostly): Grow up. Writing is not a jewelry exhibition, where your main goal is to show off your fancy-schmancy linguistic accessories. Speaking of emotion: Description IS emotion. I learned that recently when Mark Overby read his short story, “Morphine.” (To see Mark’s full story, please scroll all the way down.) I found “Morphine” haunting for two reasons: its subject matter and its descriptions. I couldn’t shake the feeling that I was there – yes, there with the prostitute. I saw her scarred wrists and felt a desperate breath against my neck. He emailed me his 326-word story and I read it: 17 adjectives and adverbs. Seventeen total. That’s not a lot, but the piece is drenched in description. Why? How? Emotion. The story’s two characters are crammed into a tiny room that reverberates with their loneliness, loss, and pain. There was nothing in Mark’s writing about “bloodshot eyes.” That was my contribution, and I didn’t even realize it until I read the piece on paper. Good descriptions work that way. They go beyond the physical to evoke readers’ emotions. When our emotions are flipped on, our associative faculties go into overdrive, and we enhance the writing with our own sensory experiences. Good descriptions bring that out in us. In English, it often seems there is no “perfect” word to describe a person, situation, emotion, or thing. That’s when an elusive drumbeat of disguised repetition comes in handy. I refer again to Mark’s story, Morphine: His conservative sprinkling of adjectives and adverbs emit various hues of darkness: broken, bruised, withered, matted, bitter. The words aren’t strung together. They’re scattered, and you barely know they’re there… but you feel them. Why is that cliché nevertheless such a descriptive and memorable metaphor/simile? Clearly, it contains a kernel of truth. Eyes indeed reveal a lot about how we feel inside. If they flicker, if they flinch or flutter, they become dead giveaways to the secrets of our psyches. This description stuck with me because it contains a simile that is topped with a paradox. It’s like ice cream – with a rotten cherry on top! The filthy smoke from the broken prostitute nevertheless forms a halo above her head. To me, the description evokes feelings of sympathy, distress, disgust – and confused transcendence. Good descriptions embed themselves in our flesh with uncomfortable irony or newness, sometimes benevolent but often depraved. Good descriptions aren’t about words so much as emotion. They make us see, they make us smell, they make us hear, taste, and feel. But even more, they make us emote. You can always go back and kill your darlings. She was my morphine, just someone to kill the pain, someone to keep me from killing myself. The smell of Marlboros filled the tiny room, my sleazy little sanctuary that I payed for by the hour, a place for me to confess my sins while creating new ones as quickly as I could. She took one last hard drag off her cigarette and exhaled a cloud of filth, the smoke encircling her head like a halo. She was beautiful and broken and she was all mine, mine to fall in love with, to hate, to cry with, to kiss and bite and caress. She was my goddess and my savior, my excuse to live another day. She was my morphine. I watched her undress with a hunger that only loneliness brings. Her dark eyes stared into mine, looking for the soul that I had lost years ago. Her small mouth glistened with the residue of the previous shadow before me, one that needed to feel human again, if only for that brief moment. Now it was my turn. I was now the sin that needed confession, the scourge that wanted love, the shadow that no one saw, no one but her. My morphine. Her outstretched hand beckoned for my touch, the scars of past lovers adorning her wrists as I placed my hand in hers. “Lie to me, please.” The desperation in her voice mirrored her situation. I love you, let me take away your pain. My words dripped into her like morphine. I traced the tattoos along her bruised neck as she gasped in rehearsed ecstasy, my fingertips writing an oath of submission against her withered skin. The warmth of her body was bleeding away as she clung to me for comfort. I lied to her again and again as I ran my hands through her hair, matted with smoke and bitter memories. Together we are alone. Together we are none, together we are morphine. The other day I happened to overhear a conversation between two people who are not in our writing group, but who are also involved in making cultural products. They spent probably 90% of the conversation in status maneuvers* that involved saying how terrible the market for their work was, how hard it was for them to produce, how badly their current project was going. I often overhear conversations like this, and they drag me down. It’s like being in a room full of cigarette smoke. Do you remember when people used to smoke inside restaurants? It may have been annoying, but it was normal. But now that I almost never experience cigarette smoke, even if I’m standing outside and somebody starts to smoke, I immediately try to get away. 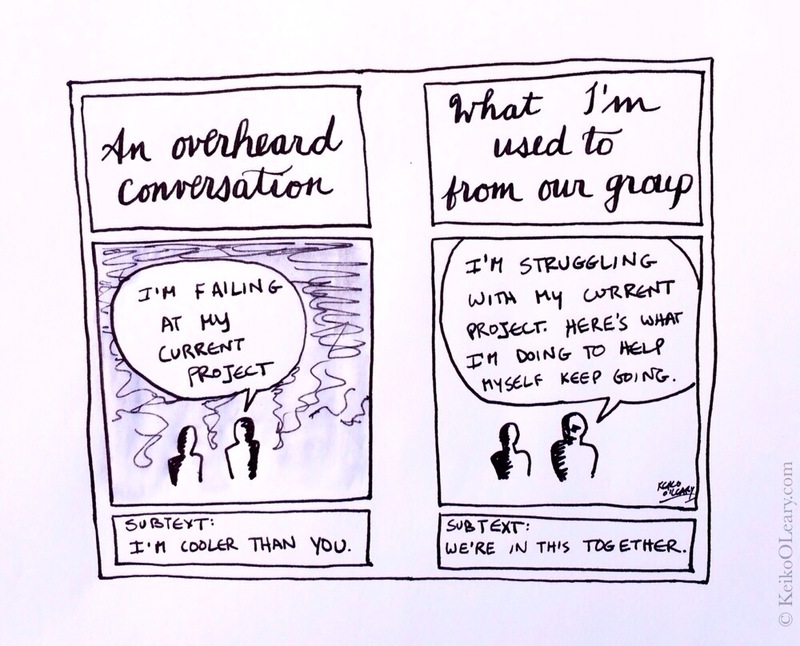 At our group people sometimes talk about having a hard time on their projects, but always in the context of how they are trying to advance, or as part of asking for help or encouraging others. I never hear people trying to raise their status by saying how much they are struggling or by insulting their own work. When I overheard that smoky conversation, I realized yet again how very lucky I am to be part of a group that creates a place of fresh air. * Footnote: You must read Impro by Keith Johnstone (to understand his concept of status, and because it will change the way you write and live). Call your local bookstore and order it right now.